All content appearing on this Web site is the property of Titus Tileworks, LLC, Copyright © 2010. All rights reserved. As a user, you are authorized only to view, copy, print, and distribute documents on this Web site so long as (1) the document is used for informational purposes only, and (2) any copy of the document (or portion thereof) includes the following copyright notice: © Copyright 2010 Titus Tileworks, LLC. All rights reserved. All brand, product, service, and process names appearing on this Web site are trademarks of their respective holders. Reference to or use of a product, service, or process does not imply recommendation, approval, affiliation, or sponsorship of that product, service, or process by Titus Tileworks, LLC. Nothing contained herein shall be construed as conferring by implication or otherwise any license or right under any patent, copyright, trademark, or other intellectual property right of Titus Tileworks, LLC or any third party, except as expressly granted herein. This site may contain other proprietary notices and copyright information, the terms of which must be observed and followed. Information on this site may contain technical inaccuracies or typographical errors. Information, including service pricing and availability, may be changed or updated without notice. Titus Tileworks, LLC reserves the right to refuse service, terminate accounts, and/or cancel orders in its discretion, including, without limitation, if Titus Tileworks, LLC believes that customer conduct violates applicable law or is harmful to the interests of Titus Tileworks, LLC. 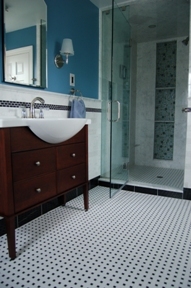 Titus Tileworks, LLC uses any personal information that you may submit through this Web site purely for our own usage. No information will be shared with third parties.